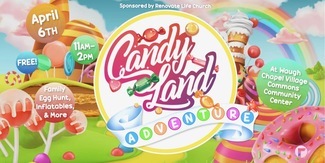 This sign up is created for volunteers for Candyland Adventure sponsored by Renovate Life Church. This event is happening Saturday, April 6th, 2019. We have rented out the Waugh Chapel Village Commons building that is a few feet past Robert Andrews and Smoothie King in Waugh Chapel Village. We have the center from 8am-3pm. Our event will begin with volunteers in place and ready to accept families at 11am until 2pm. We will have the egg hunt sending famliies through as groups with games/tasks at each environment(ex. Lollipop Woods) that moves through the Candyland Board Game. In most environments 2 volunteers will help families complete the game and give the egg to each child. One will be dressed as gameboard characters (i.e. Mr. Mint) and a helper may dress in an RLC Serve Day shirt (can be provided if needed). Although we are not providing food for the event, their will be some snacks or smoothies provided for those volunteering. Please arrive 30 minutes before our start time. We have 1 hour to tear down the event and ask for those that can to stick around for tear down. We understand someone may only be available for a hour or 2 and your time would be greatly appreciated as well. Just let us know your interest and we will find a place for you! We look forward to reaching out to the community and invite you to pray with us and look for friends and family to invited as we represent Jesus to the Crofton area and share with folks a bigger story through the Candyland Adventure! Nicole will help the first hour and Brian will do the second hour.